Stir-fry the pork strips with purchased shredded carrot and coleslaw mix to make the filling for this quick version of the popular Chinese recipe. Boneless pork chops are easy to cut into thin strips for stir-frying. 1 of 3 Saute the pork and half the garlic in 1 tablespoon oil in large nonstick skillet over medium-high heat until cooked through, about 3 minutes. Place in bowl. 2 of 3 Wipe out skillet with paper toweling. Heat remaining oil in skillet. Add scallions, carrots, slaw and remaining garlic; cook, stirring occasionally, 8 minutes or until softened. Add hoisin sauce and soy sauce; heat through, about 2 minutes. Add the pork; gently heat through, about 2 minutes. 3 of 3 Heat tortillas following label directions. 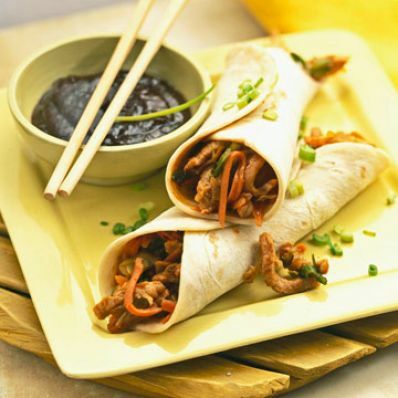 Brush each with extra hoisin sauce. Spoon pork mixture down center of each. Roll up; serve. A serving of each recipe constitutes an entire meal; you dont need side dishes. Keep this in mind when evaluating the nutrition info provided. Makes 10 rolls.